In 1381, Antonio and Amata Mancini, both late in life after years of waiting and praying, had a daughter. She grew to be an attractive young lady, popular with the prominent young men of the city. To her elderly parents surprise, she stated that she wanted to be a nun. This they could not allow and, through mild and sometimes forceful persuasion, prevailed upon her to marry at the age of eighteen. Her husband was kind and friendly outside the home; inside he ridiculed and even beat her. For eighteen years she prayed for his conversion. Finally he came and asked her for forgiveness, went to church, knelt before the priest in confession, and asked God’s forgiveness. The hapiness of his wife was short lived, however; a few months later he was found on a lonely road stabbed to death. Even greater tragedy fell upon the young widow as she heard her sons swear to avenge their father’s death. She prayed to God to take her sons rather than allow them to be murderers. The winter was intense. The two sons, looking for their father’s murderer, became ill, and were brought back home. A priest was called and they died soon after. Many months later, the widow applied to the monastery. At least three times her petition was not accepted because she was too old. Finally, she returned to the monastery late at night after all the doors had been locked, and she opened them without a key. She came into the chapel and stood before Mother Superior and the rest of the community, and asked to be admitted. They took this as a sign from God, and admitted her. For 44 years she lived a life of poverty, chastity, and obedience in the monastery. On her forehead a thorn appeared – just like the one on the crown of thorns of our Lord. She accepted the intense pain as penance for her sins. She prayed: “O loving Jesus, increase my patience accordingly as my sufferings increase.” The wound lasted the rest of her life. At the age of 76, St. Rita lay dying during the midst of winter. St. Rita had asked a nun who was kneeling by her bed for a rose from the monestary garden. The nun thought that Rita was delirious, but to please her, went to the garden. To her amazement, the nun found roses blooming in the middle of winter. For this reason, St. Rita is often pictured holding a rose. O HOLY Saint Rita, exemplary Augustinian Sister, we honour you for your devotion to the Passion of Christ. Although your early life was filled with disappointment, frustration, and unceasing tragedy, you never lost faith and trust in God. For this you are the patroness of the impossible, and our inspiration and advocate in desperate circumstances. 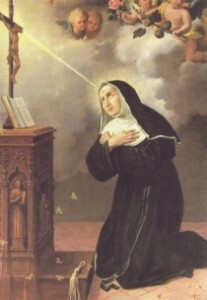 O Blessed Saint Rita, my powerful advocate, behold me prostrate before thy Divine Spouse, Jesus, thy Lord, thy God, and thy All. Behold me recalling His favors to thee, that thou mayst plead for me. May this blessed Rose, sweet with the memories of thy daily acts of love before the image of the Crucified Savior, and of the wonders wrought for thee in thy dying moments, give me confidence that thou in Heaven wilt plead that I, too, may share in the good things God has in store for thy clients. Saint Rita, mystical Rose of every virtue, pray for us. We honor you Saint of Cascia, for your faithfulness to the promises of baptism. Intercede for us with the Lord, so that we may live our vocation to holiness joyfully, and consistently, thus conquering evil with good. We honor you, glorious Saint Rita, for you witness of love for prayer all your life long. Help us to remain in unity with Jesus, because we cannot do anything without him and can attain salvation only by invoking his name. We honor you, Saint of reconciliation, for the fortitude and courage you proved in the most tragic happenings of your life. Intercede for us with the Lord, so that we may overcome any doubt or fear, believing in the victory of love. We honor you, Saint Rita, experienced in family life, for the example you offered as daughter, as spouse and mother, as widow and religious. Help us so that we will make the most of the gifts we’ve received from God, sowing hope and peace through the accomplishment of our daily duties. We honor you, Saint of the thorn and the rose, for your humble and true love of Jesus crucified. Help us to repent of our sins and to love him and serve him in truth as you did.